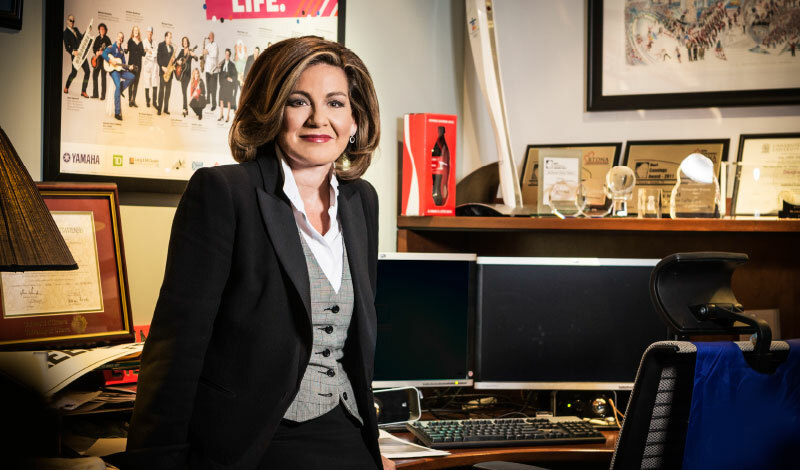 The award-winning Canadian journalist Lisa LaFlamme reflects on her career as a broadcast journalist and talks to Dolce Magazine about her path to success, international reporting and the evolution of the medium. Oftentimes, the early foundation of one’s life forms the path forward. You need look no further for evidence of this than Lisa LaFlamme, one of Canada’s most visible citizens who, in the face of frustration while trying to break into her chosen field, stayed true to her dreams and followed her passion for journalism to rise to the very top as chief anchor and senior editor of Canada’s most watched newscast, CTV National News with Lisa LaFlamme. Born in Kitchener to David and Kathleen LaFlamme, she graduated from St. Mary’s High School and then the University of Ottawa. She began her career at local CTV station, CKCO Television in Kitchener as a copy writer and script assistant, then became news reporter at CFCA/AM109, and eventually rose to television reporting and an anchor position at CKCO. She became co-host of Canada AM in September 2001 and she worked as a parliamentary correspondent for CTV News Channel and as a national affairs correspondent for CTV National News with Lloyd Robertson before being named his successor as chief anchor of the national news on September 5, 2011. 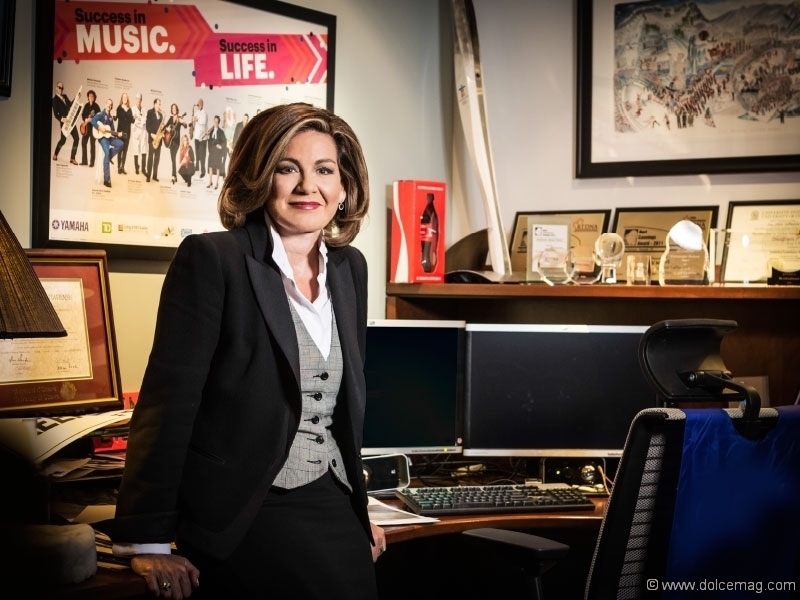 LaFlamme is one of Canada’s most accomplished and honoured journalists, with five Canadian Screen Awards since 2014 in the Best News Anchor and Best National News categories for her work on CTV National News. In 2016, LaFlamme was made a Member of the Order of Ontario. LaFlamme recently sat down for an interview with Dolce Magazine in her office just after a lunch with her dear friend, fellow University of Ottawa alumnus and the host of TV’s Jeopardy, Alex Trebek. DOLCE MAGAZINE: What’s the best advice you’ve ever received? DM: Where did this passion for journalism come from? LL: I used to love to write stories as a kid, and I remember in Grade 9 going to my guidance counsellor and telling her I wanted to be a … I don’t think I used the word “journalist,” but something along those lines. She told me, “Okay, you need physics.” Now I can tell you, in 29 years in this business, I’ve never used physics, but I took it anyway and barely passed. I’ve just always loved asking questions and hearing the answers, and it’s been a privilege for me over the years to be able to tell someone’s story. When somebody puts their faith in you to tell their story, that’s really a relationship you can’t beat, and you have to honour that in a truthful and upfront way. DM: Have you had someone you considered a mentor in your career? LL: In the industry, certainly Lloyd Robertson, who has been a guide and listening post and such a fabulous friend. Through life at every juncture, there is a mentor for that moment, getting us to the next step or phase of our lives. I’ve been very fortunate to have so many people, for whatever reason, put their faith in me to help me keep telling stories. DM: Technology has changed a lot in recent years. How have all the new platforms and social media transformed your industry? LL: There are now more ways to tell a story, which is great. I think that with all the great things we’ve seen about social media, there is also this horrifying side, and it can be like rat poison — like Twitter, for example. It can be both things. There is so much negativity. I have chosen to weed out what is constructive criticism and what is somebody just vamping. DM: Technology has certainly increased the feedback. It used to be a one-sided broadcast, but now it’s so much more interactive. LL: And I love that. I love that people are watching. In the old days I’d get letters. Now it’s not really emails, but tweets. But the interactive nature of it makes us all the more accessible, which I think is a good thing. DM: Your show is much more than a national newscast. Tell us about a typical workday. LL: It starts the minute you wake up. I listen to BBC World at 7 a.m., then switch to CBC News Network — I’m always watching everything. We have our first meeting at 11 a.m., but it’s an ongoing conversation all day long. I physically come into the office at 2 p.m., and we have meetings, and then we write the show from 5:15 p.m. until 10 o’clock. I am literally still writing until the floor director yells “Three minutes!” and I have to run to the set. It’s the same thing every night — I’m going to push it to the deadline every day. But I have such an incredible team. It really is a family here, and I’m very lucky to be working with such a beautiful group of funny, interesting and intelligent people. DM: Do you just shut down when you get home at night? LL: I try to, but I’m usually listening to podcasts, like The Daily from The New York Times, This American Life or Alec Baldwin’s Here’s the Thing; it depends what mood I’m in. But at that hour I don’t want anything too interesting or I won’t sleep … so I usually fall asleep to Alec Baldwin, which is a compliment. DM: You are so busy with the broadcast, doing interviewing, writing and research. What do you do in your free time? LL: It very often includes binge-watching on a Saturday. I love to watch whatever the hottest thing is, especially during the wintertime. We have a cottage, and I have a Labrador retriever, and every day I walk my dog for 90 minutes through the woods. It’s great therapy to be out there. I have lots of great friends and a very full and balanced life — knock on wood. If anything, I wish there were just a little more time to just do nothing and relax. That’s the challenge. But I’m extremely happy. DM: Are any of your family members in the media or news business? LL: No, not at all. My father had a construction company, and sadly he died six years ago. I have three sisters, whom I talk to every single day. They are my best friends and my touchstone for reality and honestly, the funniest women on the planet. They are all in the Kitchener/Waterloo area. DM: You’ve covered stories all over the world. Have any experiences stood out to you? LL: It’s hard to choose just one story, because it depends. I do remember I had the opportunity to go to Iraq and visit a refugee camp where these women had literally just escaped after two years of being ISIS brides. And honestly, when you are sitting in the middle of a Northern Iraqi desert with these beautiful women and hearing these stories, you realize your responsibility. I’ll never forget this one woman — all she had was her iPhone with a photograph of her three daughters, who never got out and are still there. Just imagine the value of that iPhone — that is it until those girls, please God, are released. Just recently, Vimy in France was incredible. Thirty thousand Canadians flew to this corner of northern France to celebrate something that happened 100 years ago. One of the most beautiful monuments to our own people and troops is nearly 4,000 miles away in a field in France. That was very emotional. We were with Roméo Dallaire and double amputee Paul Franklin, and Canadians were just hugging them and crying and thanking them, so that was amazing. If I ever get on a plane and say, “Well, that was a bore,” then I don’t think I’ve done my job, either. Because if I think it was a bore, then how do you think the viewer would have seen it? I think for every experience, I hopefully am able to pull something out of it. DM: You’ve interviewed so many famous people. Is there one person or interview that stands out as the most memorable? LL: Wow, that’s always a challenge, as I’ve had so many fascinating interviews. Benjamin Netanyahu was absolutely fascinating. Colin Powell, right when the U.S. was about to invade Iraq, and he believed they had weapons of mass destruction, was a fascinating interview. But sometimes, it’s also a person on the street who you interview and who will move you. Of course, it’s always interesting to interview a prime minister, as you can challenge them on things that Canadians are interested about. I do get nervous before these because I feel if I’m not nervous beforehand, it’s like I don’t respect my audience. I don’t take anything lightly, and nothing just rolls off your back. I’m confident in my ability because before I interview anyone, I’ve done a mile of research. But you never really know how anything is going to go until the camera starts rolling. DM: In these interesting times, what do you see as the future of news broadcasting? LL: That’s a great question that I wish I could answer. I’m nervous for the industry, as I see the challenge newspapers are having and know we are not far behind. It’s a struggle, and I can’t predict, to be honest. I like to believe there will always be a market for a traditional news broadcast. We get over a million viewers a night, but I know more and more people are not watching it the way our parents did. But journalism will never die, storytelling will always be there — it’s just a question of how will the message be conveyed. It’s very difficult to predict, but then, who could have predicted that we could have a phone conversation and see each other [at the same time]? So I have to believe that whatever great innovations got us here will somehow also get us to the next level, and journalism will always, somehow, be a part of that.